Err. It’s not. Please read the bottom of this blog article. Note: This is with some form of overclocking. Sorry. Can’t say anything else about it. Also note that the used model identifier (Macmini8,1) and board-id (Mac-50619A408DB004DA) were only used, I’m told, to make the setup easier. This is certainly not an indication of a new Mac mini (sorry). Same score… but with a different model/memory configuration. We are also still months off of a release so let’s take this with a grain of salt. Update 2: This is not a new Apple product, but one and the same hackintosh (with two different SMBIOS setups). Well. That is what I was told. Update 3: I also asked for the IORegistryExplorer dump, which I always do, and got nothing. Not even a reply. I then started to browse Geekbench results, and what do you recon. Look here. I am now convinced that the two Geekbench results are made up/fabricated. That these are fake. Rubbish. Yeah. You know what they say. If it seems too good to be true… it probably is. Seriously? What is wrong with people? Asus Z170 PRO (or better). Intel i7-6600 (to be replaced by K variant). 512 MB Samsung SM961 (not a typo). I am still using the Intel HD Graphics (530) but I also want to play with the new Nvidia GTX 1070 and/or 1080 (not the founders edition). SeaSonic 80 PLUS Platinum 400 Fanless (to be replaced by a 520 Fanless when the Nvidia GPU arrives). I am currently using a 27″ Dell monitor (2560 x 1440) but I want something new so I ordered the Dell UltraSharp 34″ (curved) monitor and the Philips BDM4350UC 43″ 4K IPS monitor. One or both may be returned without the next 30 days. Or not. That is if I like them both. I would love to have a motherboard with Thunderbolt 3 and WiFi support, but paying 200 Euro extra, on top of the Z170 Pro, that is in my opinion not worth it. But perhaps someone else here knows a better motherboard? p.s. I only want USB 3.1 port(s) driven by Intel chipset. So far nothing new, but still good to see him here. Hmm. This is interesting. 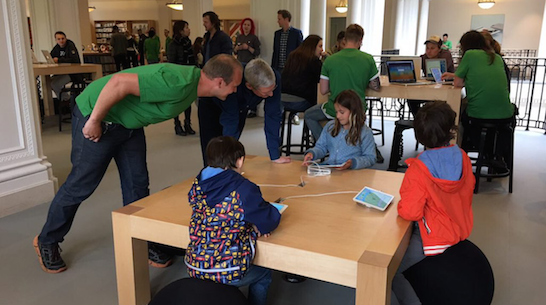 Apple folks are going to volunteer, assist and teach teachers in The Netherlands. Nice. Sorry Eric. I am going to the Apple store now. Crap. 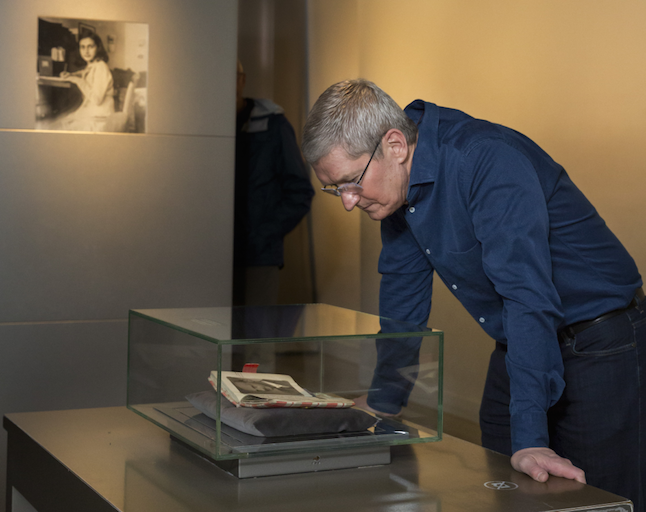 Tim Cook went to the Apple Store yesterday already (I missed it). Anyway. 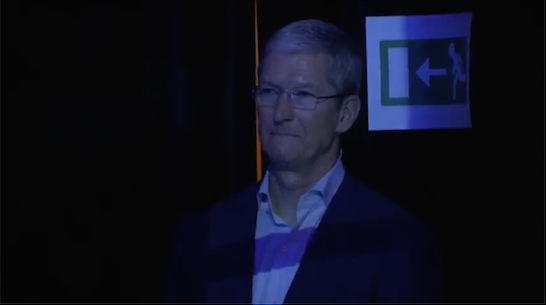 Where is Tim Cook? I know he’s not visiting the Anne Frank House, because he was there yesterday already. Too bad. I had some question for him… about open sourcing OS X. And not just parts of the kernel and some drivers, but the whole lot. Note that the device id’s 0x1906, 0x190B and 0x192B cannot be found in the frame buffer data. 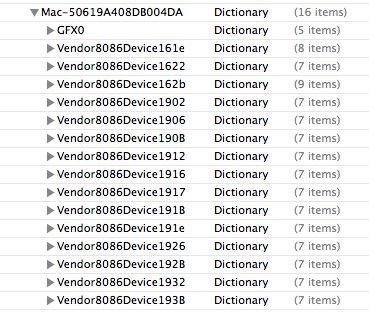 Which is still the same as what I found in OS X 10.11.4 Build 15E65. And some of the frame buffer data sets, for device id’s 0x1902, 0x1912, 0x1917 and 0x1932 will first need an update before they are fully supported. Anyway. Next time you see a Geekbench score with board-id Mac-50619A408DB004DA and a funny looking model identifier, then you know what to make of it. 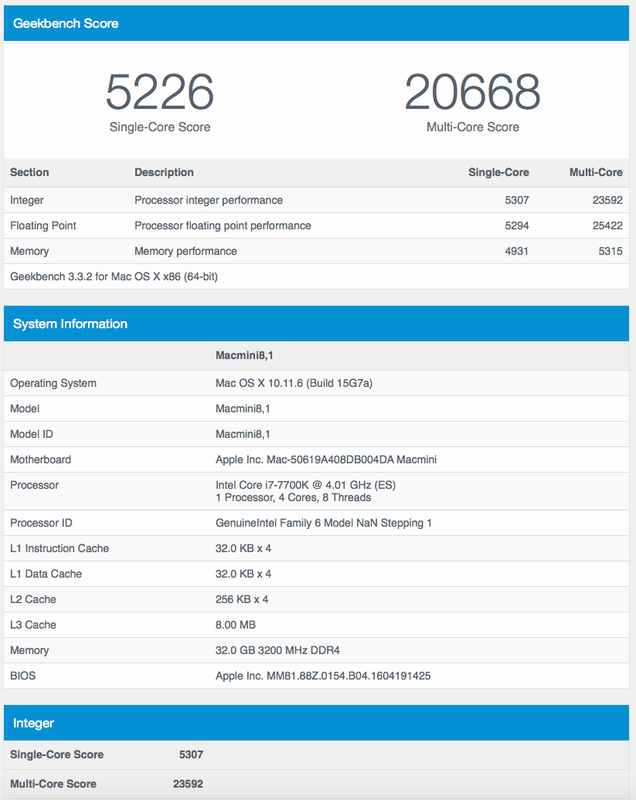 Edit: They used Build 15W4314 during the test runs with Geekbench, which may be an indication that we won’t see new hardware before OS X 10.12 is released (10+12=22 and that happens to correlate with the letter W).